You might know him as the man who shouts something that sounds like "odd-DEURRRR, odd-DEURRRRR!" Speaker John Bercow has become the subject of numerous memes as Brexit has rumbled on over the past two years. But now - by torpedoing Theresa May's "Thank U Next" approach to voting on her deal - he just placed himself firmly at the centre of the drama. So what's his role? And why is he such a big fan of order? Firstly - what just happened again? The prime minister was hoping for another chance to put her Brexit deal to a vote - it would've been the third time. But Speaker Bercow decided that can't happen unless the deal has changed or a new session of Parliament begins. Everything was disguised by complicated, flowery language and references to ancient rules. But make no mistake, this was savage. John Bercow might as well have followed it up by donning a pair of sunglasses and playing a blast of Meek Mill's I'm A Boss over the Commons PA system. Simply put, the Speaker is in charge of what goes on within the House of Commons. If the Commons is the TV show Pointless, then he is Alexander Armstrong and Richard Osman combined. Imagine that for a second. So that's why he steps in when things get too rowdy with his trademark cry. Contrary to popular belief, he's not simply a fan of hors d'oeuvres. By tradition, the Speaker is above politics. He is supposed to represent only the rules and conventions of Parliament. So when he or she is elected, they cease to represent their party. For the record, John Bercow was originally a Conservative MP but he's been the Speaker for nine years now. The title of Speaker dates back to 1377, and Sir Thomas Hungerford was the first. Back in the day it was a dangerous game. No fewer than seven Speakers were beheaded before 1535. The modern role of the Speaker being independent from political parties evolved in the 18th and 19th centuries. Read interviews with John Bercow and it's clear how he sees his role today - making sure no political party disrespects Parliament by bending or breaking the rules. And he says that's especially important now because no party has a majority in the House of Commons. He has many opponents though, and has become a controversial figure in many ways over Brexit. Some Brexiteers just see him as a frustrated Remainer trying to prevent the UK leaving or at least push us towards a "soft" Brexit where we keep close ties to the EU. In many ways, John Bercow seems tailor-made for the age of social media. He tells it like he sees it, he shouts a lot and he even has a catchphrase. No massive surprise, then, that he became a meme earlier this year. He's become popular across the rest of Europe as well, with German newspaper Die Welt claiming last weekend that he's better known there than any of our party leaders. The Sunday Times described him as "Europe's surprising new pin-up". "I'm a regular at my club with my son, a season-ticket holder at Arsenal. There are 60,000 people in the crowd, who think they know better than the referee." That's how Mr Bercow described his role as Speaker when he was interviewed by the US broadcaster CNN. He also told the Guardian newspaper he's "always been passionate about Parliament", adding: "I've always believed strongly it could do a better job." So as Brexit rumbles on expect to hear "Odd-DEURRR" this afternoon and every weekday for quite some time to come. Probably. 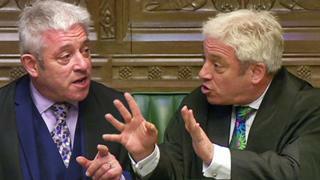 Who is Commons Speaker John Bercow?